This event has become a highlight of the MAANZ symposia. 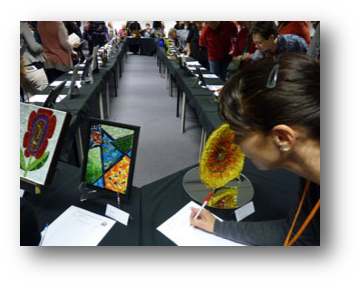 Symposium attendees and their guests have the opportunity to browse and bid for unique mosaic art works. Attending the salon is open to all symposium attendees but to exhibit and sell in the salon, you MUST buy an exhibitor’s place. NB: This is a separate event from the National and 30:30 MAANZ exhibitions. Read our FAQ document (click here) before buying your place. This year we have 35 salon places for exhibitors. Buy your spot now before they sell out. It’s a really popular event and details of the piece aren’t needed till later in the year. A waitlist will be available. Work exhibited in the salon must be mosaic and has to be 30 x 30 cm or smaller, but there are no other restrictions. You get to set your own starting price and are responsible for the sale. MAANZ takes no commission. In 2017, 95% of the pieces sold. Registered salon exhibitors will be contacted by the salon co-ordinator Marian Shapiro and asked to submit details of their piece by 22nd August, so you don’t have to have a finished piece in order to buy your place. Guest tickets to attend are also available.